Push yourself to scrap more than one photo. I like to combine 4 x 6 photos with wallet-sized ones to get a better feel for the event/moment and to add more personality to the layout. I also love to pick up the main colors in a photos with the border of the layout page, so this light floral pattened paper was a great compliment and makes the photos pop. I love how there are multiple sizes of alphabet stickers included with each collection. It was fun to wrap my title around the page and start with the largest letters (featured below) and end with this phrase using the smaller red alphabet. The grid patterened paper makes it so easy to line up all the elements on the page. The 4 x 6 journal elements make great photo mats, like the one I used here to make this funny picture of my son stand out a little more on the page. The cardstock stickers are wonderful embellishments and sentiments. Add a little bit of foam tape to make them more dimenstional without too much bulk on the page. Simple is the way to go at a busy time of year like Fall. Hope this page provides a little inspiration on how to scrap in a hurry. Hope you had a crafty weekend too! Hi all! Kay here with another fall layout to share using the Harvest Lane collection. I adore fall, and it is absolutely BEAUTIFUL in Michigan. Warm sunny days full of color, and cool evening walks through crunchy leaves . . . it's my favorite season! I quickly embellished this little pocket for a little something extra on the page. Hello there! Donna here, your host for the blog today sharing a few cards and tags I made using Harvest Lane. Living in Southern California we don't get a drastic change in weather this time of year. The change of the season is much more gradual. Regardless, fall is my favorite season, and I like to take some time at the beginning each new season to make a few cards for whatever occasions might arise. Can I tell you how happy I was when I found out that Simple Stories had created a fall collection? I knew it would be perfection, and I was right. I had so much fun creating these cards... the patterns and colors, everything about Harvest Lane just makes me happy. Sometimes when I'm making a set of cards or tags, I like to make one and then create something else that is just a slight variation on that same design. As you can see in one of the tags below. Perhaps now is a good time to mention how much I love metallic embossing powder? And doilies. And butterflies. I wanted to keep the design of the tags simple and delicate. That teal dot paper, one of my favorites. But really, I don't think I could choose... I adore this whole collection, and I'm looking forward to using it to record our fall memories. What I've shared with you today is just the start! I hope you enjoyed today's post, and wherever you are, Happy Fall! I used bits from Harvest Lane and Take A Hike to piece together a non traditional Halloween layout. I cut some little pumpkin shapes with my Cameo and machine stitched around everything for an applique look. I hope you will consider piecing together some fun Simple Stories for your Halloween layouts this year! I love the colors in the Documented collection, I have a lot of brown's in my house (My door is actually brown, but looks grey in the photo for some reason), so the color palate in the Documented collection was perfect for my project. I started the project with a large wooden plaque, and I painted the edges of the plaque with cream colored paint. I then covered the plaque with Memories #2306. I cut the craft pumpkin in half, sanded the edges and glued it on the center of the plaque (hot glue worked great). I added some cardstock stickers from the Documented collection, burlap, and die cut felt leaves. I cut the flowers from Ever After #2305 and the letter R from Noteworthy #2307. These were cut with my eclips machine. First I line the stickers up along a strip of colored cardstock, trying to evenly space them. Next I cut around each pendant, leaving about an 1/8 th of an inch around them. After I have cut around them, I snip the extra paper left in-between them. Finally the last step is to add the letters to the banner. I gave the project a good coat of clear sealer to help protect it from moisture. I hope you enjoyed my altered project for today, have a wonderful Monday! Don't you just love having the smaller versions of Simple Stories fabulous collections in a 6x6 paper pad? Guiseppa here to share with you why I love the 6x6 paper pads from Simple Stories. If you are anything like me, sometimes you just hate to cut into that wonderful piece of 12x12 paper just for a small part of the paper. That is why I love the 6x6 paper pads. I am going to share with you a mini album I made and I made it all by using the paper from the Fall Harvest 6x6 paper pad. I made a 6x6 album...perfect for my mini album. As you can see...I have been using the 6x6 paper pad to cover the pages of my album. Some of the little embellishments on these pages are also cut out from the 6x6 paper pad. This cute journaling tag was made from the 6x6 paper pad too! So, that is why the 6x6 paper pad is simply perfect for your crafting needs! Thanks for stopping by today! Hi everyone, Kim here with some HARVEST LANE CREATIONS! I love the process of creating...and normally I'm okay with working on one project for hours -- even days. But then there are those times, when I am atsy to create but only have an hour or so and want to end up with a finished product. Definitely my go-to products in those moments are my Simple Stories collections. The elements make any creation, even the fast ones, fun & fabulous! Mat photo on cardstock and adhere to background paper. Fussy cut two journaling blocks and adhere to bottom left corner of photo. Using pop-dots, adhere banner stickers to page. Tuck bakers twine behind banner stickers. Fussy cut banner paper pieces and adhere to page. Add letter stickers and quote sticker. Doesn't that wood fence background paper make for a perfect page? I just love how this looks and I love it even more because it took me 15 minutes....just enough creating time to lift my spirits and make me happy on a crazy busy day! What I love about the Harvest Lane collection (okay, what I love about ALL Simple Stories Collections) is how flexible they are. Even though Harvest Lane is a fall collection full of rich deep fall colors, it is versatile enough to use for more than Fall themed layouts. My design below is all about the grand opening of one of our local favorite restaurants.....that just so happens to design their restaurants and products around the same fall colors. And just in case you were wondering where my cards were....here they are....and guess what? They aren't traditional fall themes either! Thanks for letting me share my goodies with you today....be sure to stop in at your local scrapbook store and pick up the Harvest Lane Collection....it's a favorite! Want even more fall fun? How about a giveaway? 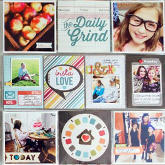 Scrapbook & Cards Today has a whole new look and you can win your own copy of their new Fall issue. All you have to do is leave a comment here on this post and we will draw a winner! In addition, make sure to visit the Scrapbook & Cards Today website where you can download and view the entire issue. Keep your eyes open for Simple Stories goodies as you check out all the fun ideas in this issue! The positive and the negative. Hi Simple Stories Fans, Tonya here today. I am here to share with you a layout and a card. Both projects are made using the same dies, one uses the positive space and one uses the negative space of the die. First up is my layout. I used the new Harvest Lane project for this. This layout incorporates the positive spaces from some arrow and alphabet dies. The blue letter and date stickers are from the 12x12 Expression Cardstock Stickers. For my card I utilized the negative space that was left behind when I die cut out the word 'coolness'. There really isn't a better line out there for masculine projects than Simple Stories Awesome, so that is what I grabbed to use for this card. Hello All! Wendy here to inspire you & share up the rest of my "Take the Journey" album previously shared up in Part 1 of 2 here. I'm sure you all are loving the new releases from Simple Stories revealed up at the past CHA summer show and two of those collections were Harvest Lane and Take a Hike! I worked with both of these collections on my project and actually combined them both in this project share titled "Take the Journey". Both collections speak together in colors, patterns, and also shows you how well the Simple Stories concept works in documenting the journey in the page protector format in a cohesive way! Many times I'll grab & cross mingle collections in one project and they are just always "on-point" in matching up! Also, the 6x8 Mix & Match Simple Stories albums are just perfection for weekend trips, sweet journeys new & old, and capturing the everyday. Oh, and Sn@p will be bringing that into an entire new level of cool.ness. Hope you enjoyed the peek into my album & I'll tag back this weekend to answer your questions (I saw a few in the Part 1 of 2 post) & such in your comments (along with the posting of the supply list)! Hi everyone! I'm happy to be blogging today and sharing with you a couple of cards I created using the new Handmade Holiday collection. It seems I can't get enough of the warmth and coziness this collection brings with it....a perfect feel for the upcoming holiday season. From a card-maker's perspective, the Handmade Holiday 6x6 paper pad is the perfect bundle of paper, patterns, colors, and elements. Everything you need in one package. I trimmed several images out from paper found within the package and used them as focal points from which to build and then embellished very simply with buttons, Handmade Holiday 12x12 Fundamental Cardstock Stickers, Handmade Holiday 12x12 Expression Stickers, ribbon, and a few extras. These cards came together in a snap with many extra scraps left over to create more holiday cards with!